Ballymena United Academy under 14’s secured their first league win of the season with an impressive display against Cliftonville on Saturday. The under 13’s faced North Belfast opposition themselves, unfortunately losing out to Crusaders in a tight game at Wakehurst. The under 15’s faced a classy Coleraine outfit on Friday evening and despite losing out, put on a brilliant team display which pleased coach Gary Twigg. The 12’s and 11’s racked up the goals in Lisburn with some hotshot displays while the senior 17’s recorded another impressive win against Warrenpoint on Friday as well. Derby honours went to Carniny at under 16 level on Saturday, United were well in the game for long periods and again can take some positives from the performance. BUYA U-12 10, Northend 1: Joshua Balmer put the wee skies blues in front and went on to notch 4 goals. The outstanding Ben Dallas grabbed a deserved hat-trick. Adam Millar scored 2 excellent finishes while Jonny Douglas helped himself to a goal. BUYA U-13 1, Crusaders 3: The Belfast side were two goals ahead before United captain Jordan McMullan scored the goal of the season so far with a fantastic half volley but the Crues scored a third on the break. 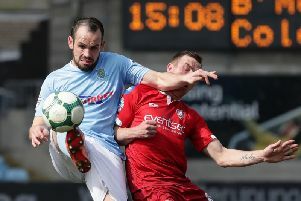 BUYA 4, Cliftonville 2: It was 2-2 at the break with Lewis Mearns and Ross McCausland on target. In the second half, Max Davidson put United ahead before Mearns sealed the win with his second goal. Coleraine U-15 4, BUYA U-15 0: Ballymena knew this would be a tough assignment against a Coleraine side featuring a number of internationals but three late goals put an unfair gloss on the scoreline. Carniny U-16 4, Ballymena United U-16 2: Stephen McColgan levelled the score but United trailed 4-1 before Jack McMurray scored a late consolation. Warrenpoint U-17 0, Ballymena United U-17 3: Ballymena took the lead against the league leaders when Michael McCabe got onto the end of a Sam Millar ball. They doubled their lead when Adam McCelland drilled home a McCabe lay off and wrapped up the win when McCelland put Sam Armstrong through on goal.